The biophysicist David Eisenberg of UCLA recently published a paper in which his group surveyed what they called the "amylome", the set of all possible proteins that can potentially form the deadly amyloid aggregate implicated in diseases like Alzheimer's. I haven't read the whole paper yet and will describe it in another post but it has some very intriguing conclusions (see the Nature News piece). 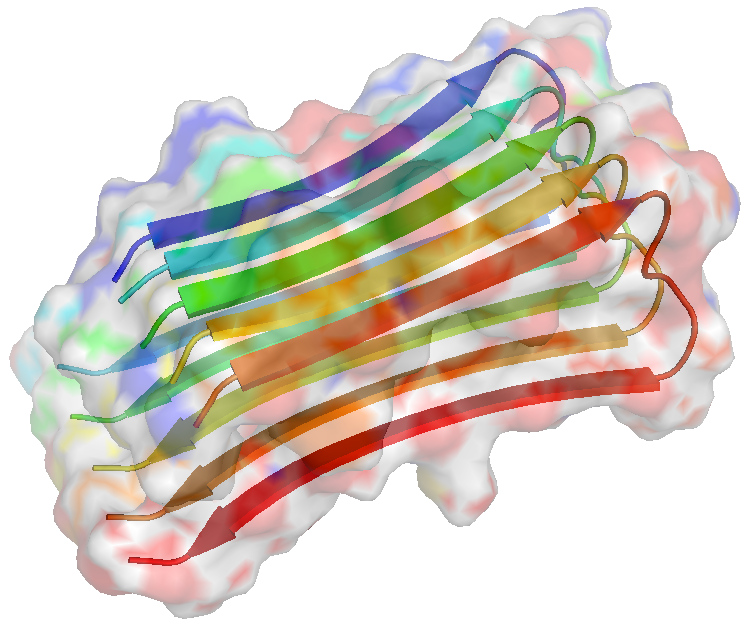 Eisenberg's group end up finding common segments possessing amyloid-forming propensity in pretty much every protein, given the right conditions. Not surprisingly, these segments are mostly kept tucked inside protein cores; if exposed the proteins are refolded with chaperones or eliminated as non-functional. But this ties in with Chris Dobson's work which I described in a recent post. Dobson's most recent paper seemed to conclude that amyloid is actually the most thermodynamically stable state of a protein, with "normal" protein states being metastable. All this is fascinating stuff, but you can always trust creationists to put an anti-evolutionist spin on almost any scientific funding. Someone named Cornelius Hunter asserts on his blog that the fact that the most stable state of proteins seems to be amyloid and that most real proteins don't actually exist in this state seems to be a kind of miracle or at the very least indicates the enormous difficulties attendant in creating complex biomolecular structures. Mr. Hunter seems to be indulging in a common fallacy, that of assuming that evolution somehow tends to an ideal. This is just not the way the process works. Considering the stringent constraints and time in which evolution has to work, it can only explore the available space of solutions and not the entire possible space. It can never achieve the best possible result in solution space, only one that is good enough under the given circumstances. I don't know if it's really that hard to understand or whether creationists like Mr. Hunter want to deliberately obfuscate the issue. Evolution can only work on what's already available; it can only mix and match existing motifs, and what exists need not be perfect at all. As an aside, this function of evolution reminds me of the concept of "satisficing" or "bounded rationality" in economics; lacking perfect knowledge of all solutions and unlimited time, economic actors like us can only pick solutions optimal within current constraints, not "global" maximums on the solution landscape. There's therefore no reason to believe that biological evolution should create the most thermodynamically stable state of a protein. Creating a state that is functionally relevant is enough, even if it's thermodynamically metastable. In fact one can even make an argument that a thermodynamically superstable state might lead to an evolutionary dead end since it will be hard to tinker with. Given such constraints it's indeed impressive that evolution creates enzymes speeding up chemical reactions by twelve orders of magnitude, but even these enzymes are few and probably not the best possible in all of enzyme space. So yes, the fact that it's amyloid and not the normal state of proteins that is the most thermodynamically stable one is fascinating, but in no way does this present a great challenge to evolution. In fact it reinforces evolution's essential character, to hunker down and make do as well as it can under the given circumstances. Don't we all? Of course, the thing to keep in mind is that the entire possible state space is not actually what one might think it is, after all. The standard presentation of Levinthal’s paradox is that the unfolded polypeptide (no secondary structure or higher) is some sort of flexible long-chain heteropolymer that is free to sample the entirety of phi/psi space. That sort of picture is applicable to long-chain polymers….that are sufficiently dilute (so as to avoid intermolecular forces being important) and in a so-called “good” solvent (that is, one which maximizes attractive forces between the polymer segments and solvent molecules, and minimizes interactions between polymer segments). As we all know, a cell is hardly a dilute sort of existence for macromolecules and water – while a very suitable solvent for many compounds – does very little for the non-negligible number of hydrophobic side chains in proteins. And we all know that amino acids can and do interact with one another. I suppose this is why I have never been too worried by Levinthal’s long-ago thought experiment. Now, you’ve got me thinking about comparative studies of thermophilic proteins, which I know have been done to some extent, but can’t recall all the details. I have to wonder if they’re more thermodynamically stable on the average, or if it’s just a matter of shifting things proportional to their preferred growth conditions. Something to look into one of these days! That's a really important point. During my postdoc I played around with the protein structure prediction program Rosetta. Rosetta generates several plausible folded structures for a given sequence and assigns scores to them. Many of these structures are of course false positives (and this scoring problem is what mainly hobbles the prediction) but I wonder if the inclusion of at least an implicit cellular environment in the protocol can be possible at all. I know that there have been some efforts recently to model crowding in MD simulations; I will have to dig up references but I think a lot of work has been done by the Zhou lab at FSU physics. That impression is surely correct, but I would suggest a stronger “*impossible* to tinker with,” and a dead end for sure. Indeed the most thermodynamically satisfied state of protein + water is the exhaustive hydrolysis product -- many amino acids -- by tens if not hundreds of kcal/mol. Dobson’s notions of kinetic safeguards work in both directions.